- Motor power:1.1-1.5-1.85 Kw 950-1450-2850 rpm 380 V - Two-speed operating option. - 2 of whisks. - 1 of dough hook. - 1 of mixing paddle - Double circuit timer and digital control panel. - Safety switch. - Stainless steel bowl. 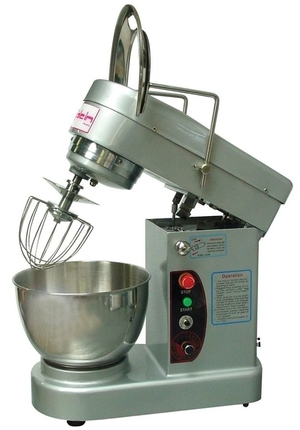 Unlike a spiral mixer, a planetary mixer has a rotating, or orbiting agitator with a fixed bowl and can be used to make food products other than dough, including cakes, pastries, cookie dough, icing and whipping cream. It may include interchangeable agitators, such as a whisk, beater and dough mixer. There are both freestanding and countertop models, though the range of sizes is smaller than with spiral mixers. When choosing a planetary mixer, consider specifics such as frequency of use, required output, capacity and necessary accessories (e.g., tilting or removable bowl). Other factors include voltage, motor speed, energy efficiency, required installation space, durability, ease of use and cleaning, as well as robustness (stainless steel rather than plastic), permanent versus mobile unit. Applicable codes and standards should be consulted and the warranty examined carefully.